I’m feeling tech-sentimental. Being back in Las Vegas for CES 2016 delivered the same fascination, frazzled nerves, future promise and faux-experiences that only the world’s biggest technology show can offer. This year I ventured alone – one small wannabe geek among 170,000 other frenetic industry professionals. There were so many smart innovations and collaborations across an entire ecosystem of consumer technologies – IBM and Under Armour (“Internet of athletes”), Microsoft and Harman (connected cars), YouTube and GoPro (3D/360 cameras). In year’s past, I have been at CES as the PR midwife to – and the storyteller behind – some of the industry’s most notable innovations. This time however, after an 18-month gestation period, I was there both as press for Our Digital Daughters and as a speaker, delivering my own baby, LikeSo, a mobile app that trains against the epidemic “like, ya know” syndrome and improves speaking skills. I’m hopeful that LikeSo is deemed a smart innovation, but it is certainly a nifty collaboration – a true start-up with an incredible team of “Partners in Speech Crime” (see #5). CES 2016 reportedly broke records and provided unparalleled opportunities for companies big and small. I know it did for me. Here are my shout outs and personal takeaways from this year’s show. “The FUTURE is today!” (But where are the women? ): “The future is today!” Samsung’s President W.P. Hong proclaimed again and again at his inspiring keynote address where he promoted “openness, interoperability, and cross-industry collaboration.” I was riveted by Dr. Wong’s presentation on the Internet of Things, and his awesome showcase of how everything around us should communicate and work together. But I was also disappointed when, one-by-one, Dr. Hong invited up Samsung’s six executive collaborators and partners, and all of them were men. How about male/female collaboration? Sure, it comes as no surprise that the CES landscape is teeming with men, but it would have been right if a woman or two (or six) would have taken to the stage. That said, I was heartened to see so many women in key CES roles, touching every major global industry and forwarding the women-in-tech movement. A few notable examples include IBM CEO Ginni Rometty’s keynote on Watson-powered innovations, Johnson & Johnson’s Global CMO Alison Lewis’s launch of a scholarship program for undergraduate women as part of the company’s commitment to expand STEM, and Founder of The Girls’ Lounge Shelley Zalis’s full slate of events including a 100-female-executive walking tour, and a “Power Your Tech” reception that I was fortunate to attend. 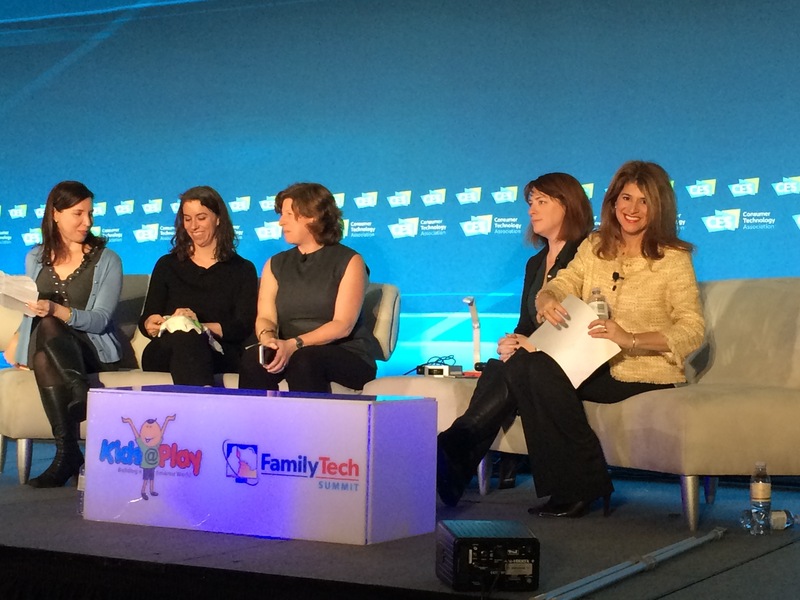 As for my own involvement, I am happy to report that FamilyTech’s panel, “Emerging Tech and Family Life,” was an all women show. I was thrilled to share the stage with moderator Rebecca Levey, Co-founder of KidzVuz and host of Parenting Bytes, and speakers: Gail Horwood, VP, Worldwide Digital Strategy, Johnson & Johnson, Nancy Smith, CMO and Co-founder, Lineage Labs, and Dulci Madden, CEO and Founder of Rest Devices. You go girls! 2. Getting My Schmooze On: The Venetian’s Speaker Ready Room couldn’t have been a more perfect venue for me to “get my schmooze on.” With my app, LikeSo: Your Personal Speech Coach, loaded on my iPhone and hot in my hand, I was excited to seek insight from the many wonderful CES speakers who innocently fell into my trap. Thankfully, so many of them were generous with their time and their stories. One tech strategist and writer introduced me to a book called, “You are What You Speak,” and told me, “You are doing God’s work” (wow!). A digital health executive lamented about his fellow colleague’s irritating addiction to the word, “actually.” A FamilyTech speaker told me about her four-year-old daughter’s excessive use of the word ‘like” (“where did she get it from?”). And, another speaker wished me luck and quickly left to practice her upcoming speech. The Internet of Things Incarnate! If you’ve worked in consumer technology over the past decades, you know Robin Raskin. Robin embodies the Internet of Things – connected, smart, open and collaborative across all industries. She is a brilliant and energizing writer and activator who has dedicated her life to teaching us all about what it means to be living in digital times. Robin has been a constant in my career, always inspiring, and keeping it real. In the last two years, and while raising my own digital kids, I pivoted away from my communications career, and started building a platform on raising digital kids, “Our Digital Daughters,” writing a book, “How Do You Raise a Digital Daughter?” and developing an app so that the way that we speak doesn’t get in the way of our success. Robin has been with me all the way – meeting me for lunch, shooting me related news stories, and helping me brainstorm. 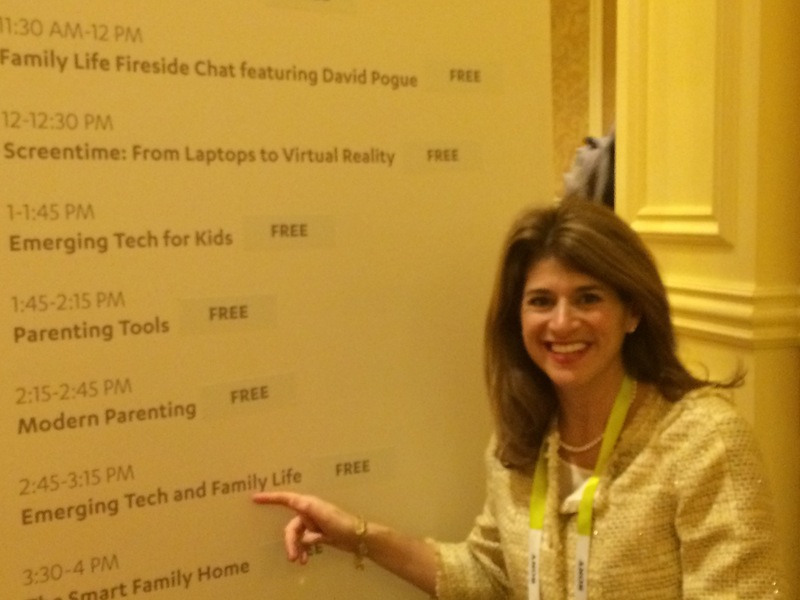 I was thrilled when Robin invited me to speak at CES’s FamilyTech Summit. Like, ya know, thank you Robin! Our Digital Daughters in the House! 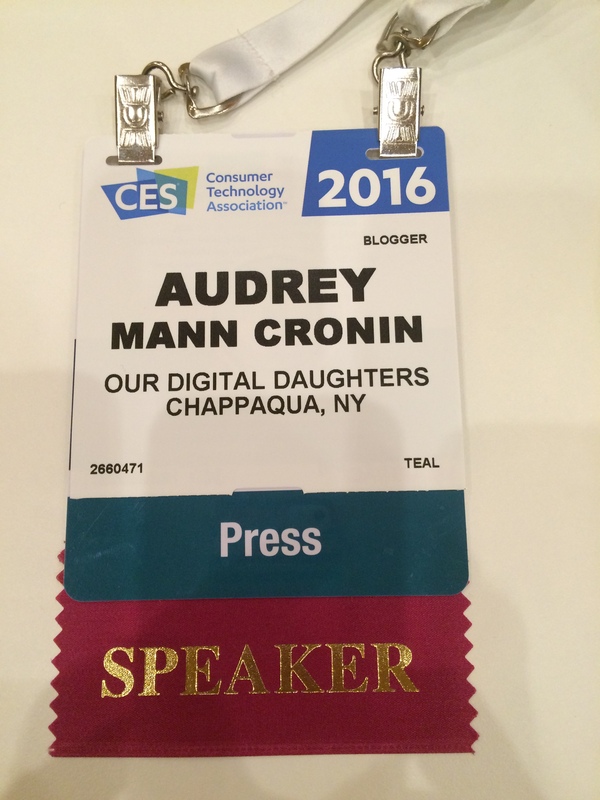 This was Our Digital Daughter’s first press event and therefore the first time my badge read, “PRESS.” I have learned so much writing about raising digital kids in our ever-evolving digital culture, informed by my own amazing and insightful teenagers, as well as my Digital Daughter Ambassadors who graciously and eagerly share their wisdom and experiences. Leading up to the show, I received countless pitches that filled my inbox – so many that ultimately I just gave up trying to sort through which ones might make sense. It gave me a newfound appreciation for the crazy life of a reporter. But, truth-be-told, “Press” privileges are pretty damn great. At the Samsung Keynote, I was put in a priority line and steered towards the front of the packed auditorium. Doors were opened for me, drinks were treated, and people look me eagerly in the eye (or maybe that was because of the high-end eye cream I tried at FashionTech which magically made me look 10 years younger – or just froze the skin around my eyes?). 5. My Partners in Speech Crime: Ironically enough, it takes a lot of talking – face-to-face, via email, Facebook and text – and in this case to the LikeSo app – to launch and test an app that acts as your personal speech coach. In creating and readying for the LikeSo debut, it has been a collaborator’s dream to partner with my brilliant college friend Phil Lam. Together, we were so fortunate to pull together a super talented development and creative team led by Randy Locklair of Hatchmap and app designer, Aaron Carmisciano. Our chief muse and teen expert on the project is my incredible daughter, Say It Media’s Chief Youth Officer Amanda. And my game-playing son, Jake, provided the insight we needed on competitive play. My husband, a tech communications expert of unparalleled measure, was and is my rock and my sounding board. 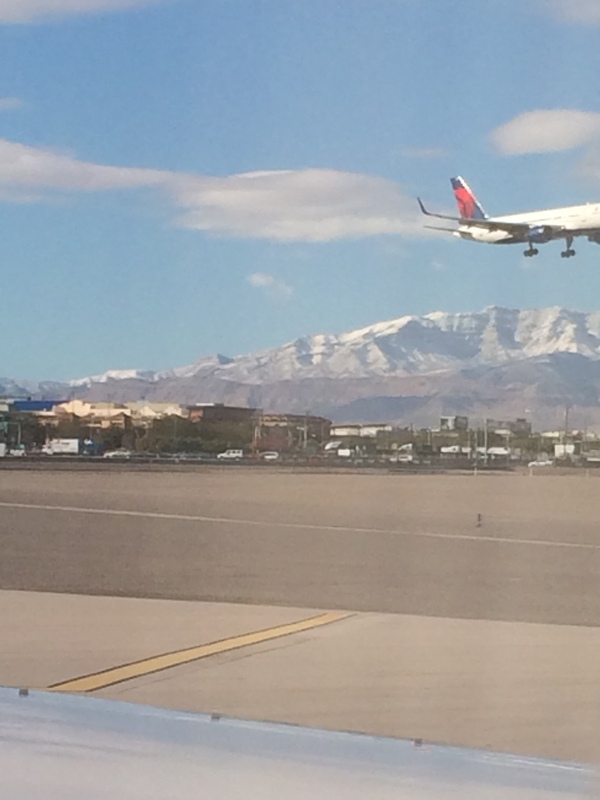 Leaving Las Vegas was both disappointing (so much more to see!) and a relief. I did have a great chat with my 26-year-old cab driver who regaled me with stories about his speech communications class, the plights of texting, and his girlfriend who is apparently guilty of many verbal habits. He gave LikeSo my final thumbs up and I bid a sad and exhausted farewell.